Found right in the historic centre of Beautiful Seville in the buzzy little Santa Cruz neighbourhood, apparently known as the tapas centre of Seville and literally just a stone’s throw from the stunning Cathedral and Giralda of Seville, so perfectly placed for easy access. 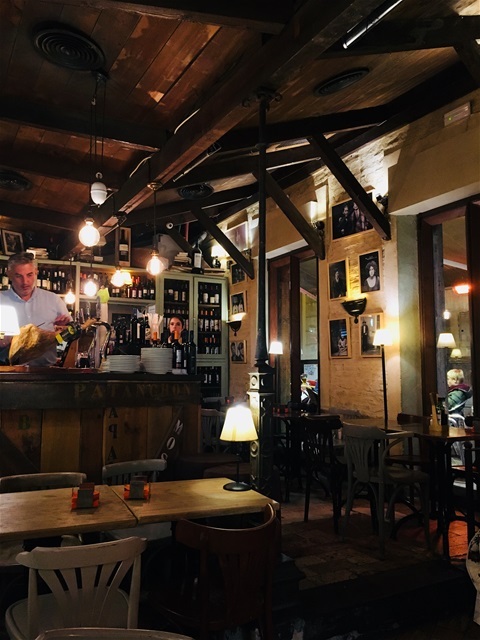 The restaurant is found in the beautiful orange tree lined gastronomic quarter in an attractive Modernist house that once belonged to a great famous bullfighter (Fuentes Bejarano) with simplistic interiors that are comfortable, the classic Sevillian dishes were a delight. The tapas were plentiful, the prawn salad was fruity and fresh, with nice fluffy croquettes, patatas bravas topped in a light creamy sauce, roast pork over crispy hand cut fries that was delicious and a tortilla that was beautifully moist. We also went for a tapas size seafood paella which was bursting with flavour and just enough to satisfy and their wide range of wines that accompanied the meal were more than sufficient. Very nice traditional food, well done that you wouldn’t complain about.